I’ve got two interviews next week for internships. WHAT SHOULD I WEAR? Also make sure you write a few answers out already like “Why I want to work here”, “What I can do for this business…etc” Smile is important and a firm handshake. Eye contact is essential. If you aren’t good at that then here’s a little trick: look at the space between his eyebrows if you can’t manage direct eye contact. If you can afford it, get a suit that is custom fit (it isn’t TOO expensive if you go to Joseph A. Bank or somewhere like that, but still puts you back $500-$1000 for the pants, jacket, shirt, tie, shoes, so I can see if you don’t want to spend that much on an internship interview, but if you’re done growing (both and height and in weight) for the next few years, now might be a good time to invest in something decent that you can use for 5-10 years. 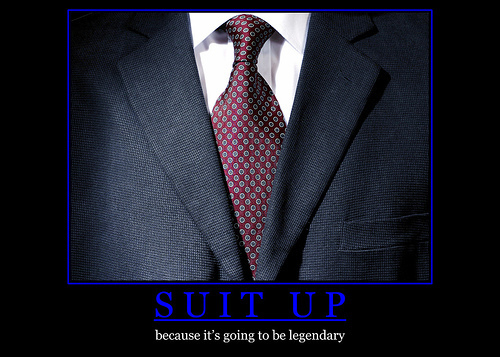 you gotta go full suit too, jacket and power tie included. edit: i wore jeans, vans and v-neck to the interview for my current job. and a polo and khakis for my best buy job i had for like 3 weeks. Prior to switching majors, my GPA was like 2.9. After changing my major, my GPA’s have been 3.5-3.8 each semester. Is there a way to note this on my resume? Because as a result of my previous major, my GPA is still only at like a 3.2, when if I’d been in this new major all 3 years I’d be sitting at at least a 3.5. I know people sometimes put “Major GPA” on their resume, but that’s not necessarily what I’m looking for because that only encompasses certain classes. GPA really isn’t important to list on an undergrad resume if you have experience already. I have heard it said it’s only worth it to show a 3.5+ cumulative GPA, unless your potential employer asks for it. To answer the original post’s question, certainly a suit and tie. I suggest bringing a notebook as well, always helps when you show off some studious note-taking during interview, when you’re on the attack asking questions anyway.